This current period includes Easter, one of our most important Christian events. Multicultural Toronto offers a vast variety of different ways to celebrate it. We also have a major Jewish holiday. These and the following events give opportunities for each of us to meet people from other cultural groups. 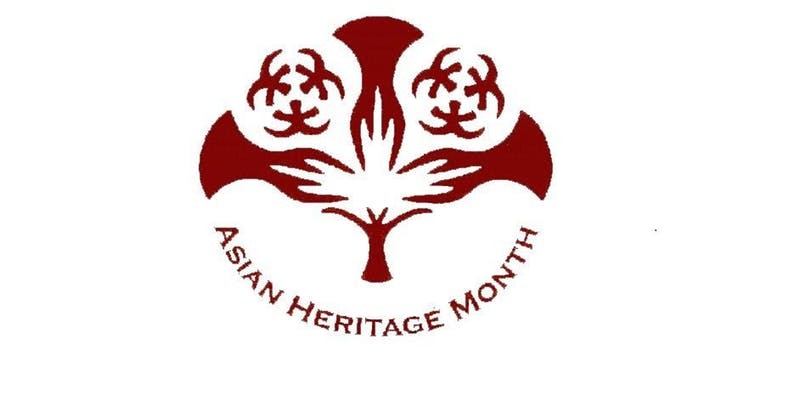 April is Asian Heritage Month in Toronto. Have you wondered what our Northern Irish neighbours think about Brexit? What’s the latest on Toronto’s Japanese cherry blossoms? How many Chinatowns does Toronto have now and how are they changing? What is Japanese anime and why does it merit a major festival here in Toronto? Why is Japanese-Canadian David Suzuki important? What’s wrong with globalization? Will China’s Ai Weiwei himself be at our International Documentary Film Festival this year? 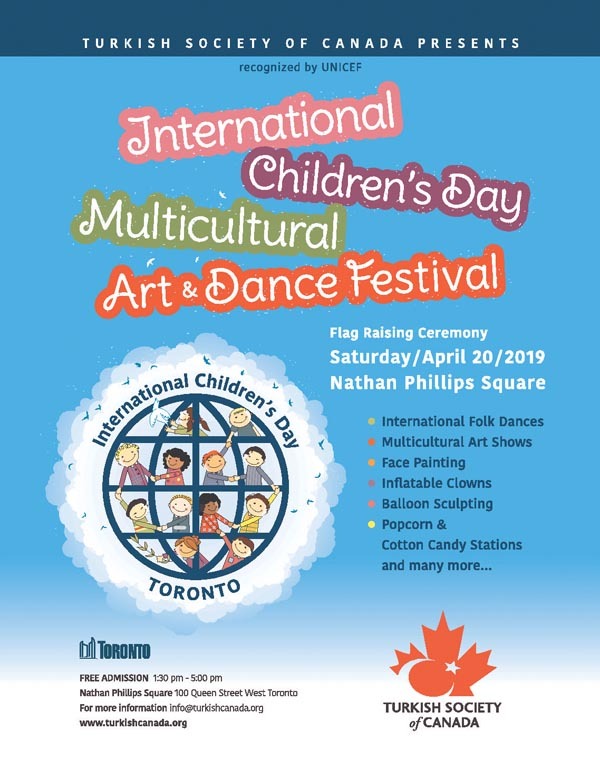 Should I take my grandchildren to Turkey’s International Children’s Day event at City Hall? Where can we learn about and sample our First Nations’ developing food scene? Please sample or at least learn about what the cultural diversity of Toronto has to offer. Many of the following events are free of charge. Asia. China. India. Asian Heritage Month Opening Ceremony. Sunday, April 21. 2-6pm. Free. Toronto City Hall, 100 Queen Street West. Special presentations and Launch of Asian Canadian Artists in Digital Age Workshops. Subjects include the world of film in China and its opportunities for Canada, Jews in Shanghai – Revisited and Parallels to Canada, and Kathak Dance: Sunset in Fall. Unity in Diversity Workshops in Toronto Schools. https://www.eventbrite.ca/e/asian-heritage-month-opening-ceremony-tickets-59327741873?aff=erelexpm. Chinese-Canadian. 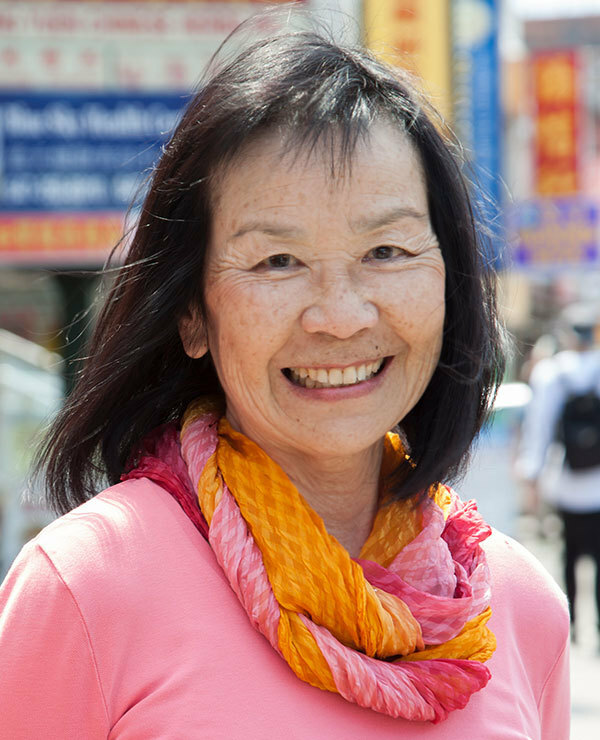 Author Arlene Chan speaks on The Chinese in Toronto: Then and Now. April 26. 7pm. $10. Yorkminster Park Speaker Series; Yorkminster Park Church, 1585 Yonge Street. Easter. Christian. Toronto. Maundy Thursday. April 18. By donation. Different times and churches. 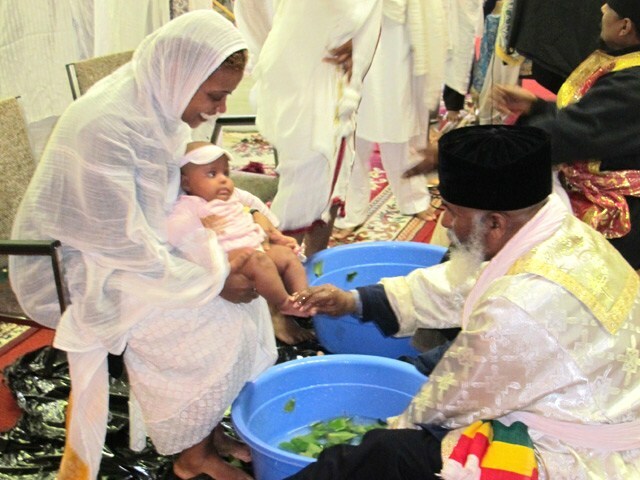 Maudy Thursday commemorates Jesus’ last supper with his disciples and is celebrated in some Christian churches with clerics washing the feet of worshipers, a Biblical tradition. Easter. Christian. Toronto. Good Friday. April 19. By donation. Many different church-related events. Some churches cover their statues and crucifixes. 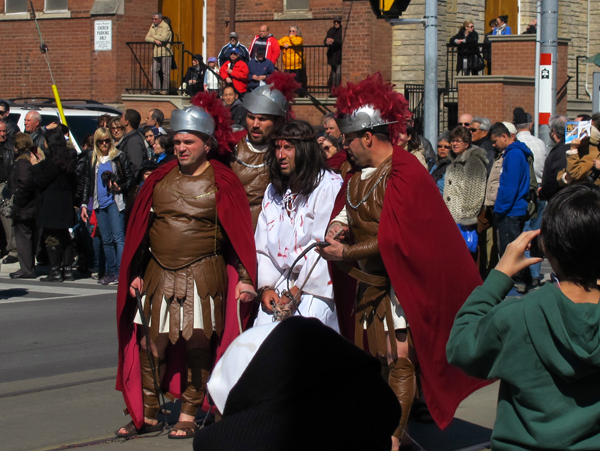 Several churches have outdoor processions. Expect sacred music. Orthodox Christians commemorate Good Friday this year on April 26. Catholic. Italy. Good Friday Procession. April 19. Approximately 3pm. Free. St. Francis of Assisi Church, 101 Grace Street (Grace and Mansfield). Ecumenical. 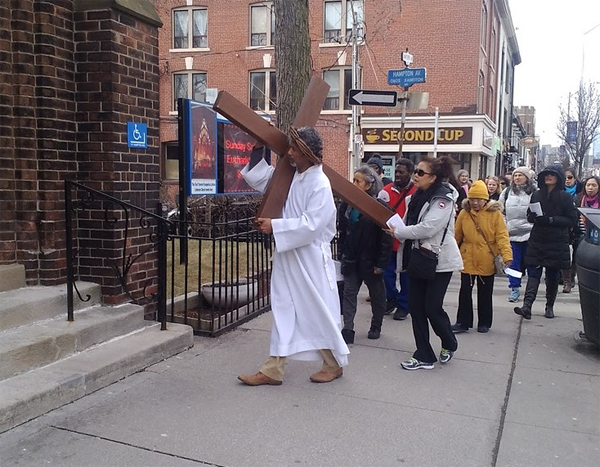 Good Friday Ecumenical Walk on the Danforth. April 19. 10am. 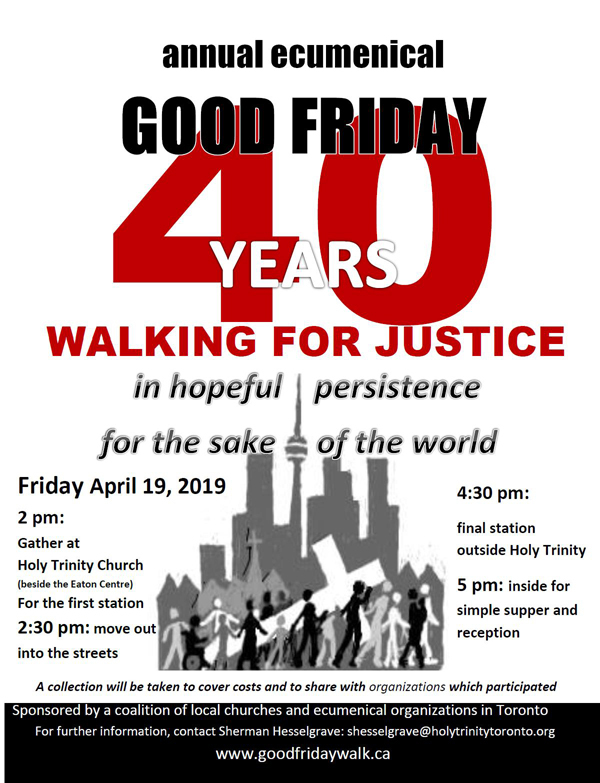 Starts at Holy Name Roman Catholic Church, Danforth and Gough (west of Pape). Image from St. Barnabas church website. Easter. Christian. Toronto. Easter Sunday. April 21. By donation. Every Western Christian church celebrates the resurrection of Jesus on April 21 this year. Eastern churches honour Orthodox Easter, Pascha or Resurrection Sunday on April 28 this year. Monday, April 22 is a holiday in Toronto with most stores, offices, schools, etc. closed. Easter. Secular. Toronto. Easter is also a spring festival with hunts for coloured eggs for the children. Expect to see baby chicks and other symbols of nature, either real or in chocolate. 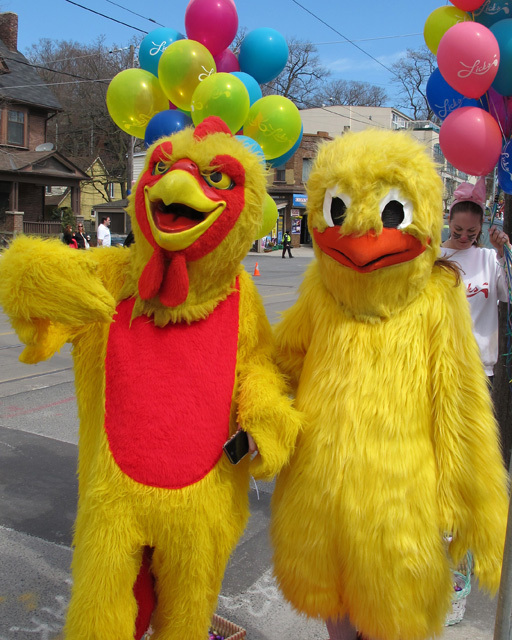 Look for actors in giant bunny or chicken costumes too. Programs at Toronto Heritage Museums, the Toronto Zoo, Centreville on Toronto Island, etc. First Nations. 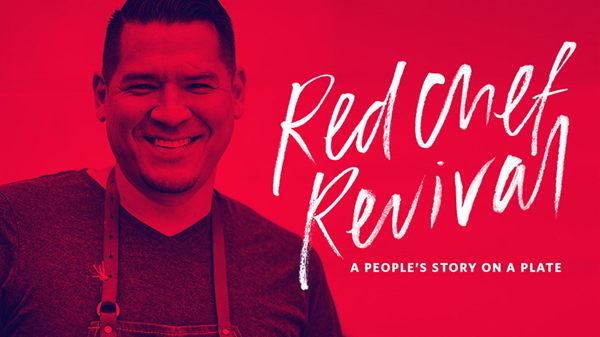 World premiere of new docu-series, Red Chef Revival. Tuesday, April 16. 6pm. Doors open. Cocktails and dinner served in the theatre. 7pm-Screening. Film + Cocktail + Dinner: $49. Hot Docs Ted Rogers Cinema, 506 Bloor Street West. Ireland. 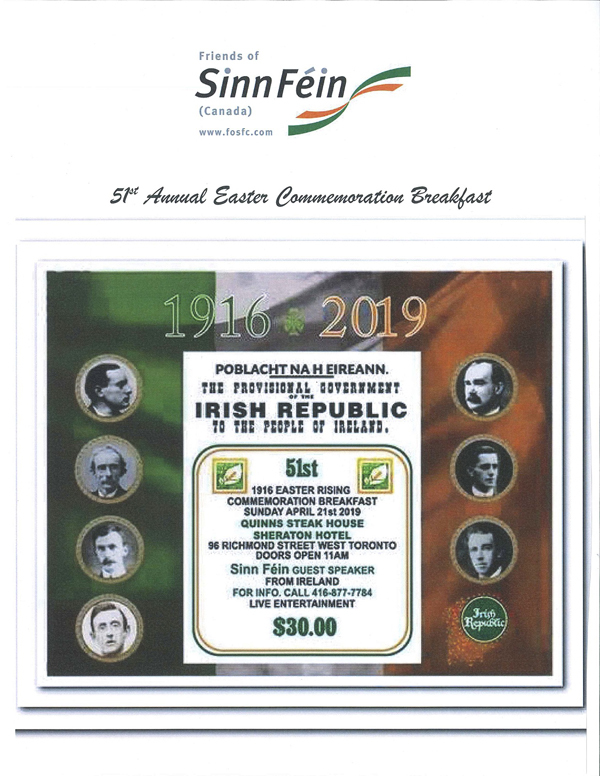 1916 Easter Rising Commemoration Breakfast. Sunday, April 21. 11am. $30. Quinn’s Steakhouse, Sheraton Hotel, 96 Richmond Street West. Speaker Senator Rose Conway-Walsh, first elected to Mayo County Council in 2009, making history as the first woman councillor elected in Belmullet since the foundation of the state. Tickets and information: www.fosfc.com. Thanks to Maureen Oleary (moleary2001@rogers.com) for telling us about this and other Irish-Canadian events. Japan. Toronto. Cherry Blossoms. Open 24 hours. Free. High Park, 1873 Bloor Street West. 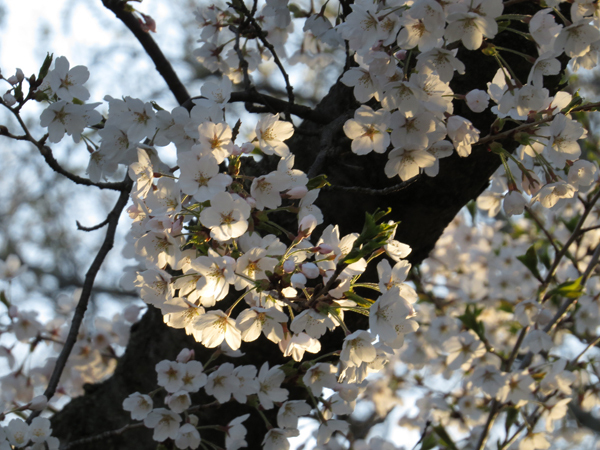 Cherry blossoms could bloom anytime between late April to early May. The full beautiful blossoms only last a short time so it’s easy to miss them. Japan. International Fan Festival. April 19-21. One day tickets available at the door. Friday: $30 / Saturday: $40/ Sunday: $30 – taxes not included. Some passes already sold out. Metro Toronto Convention Centre, 255 Front Street. 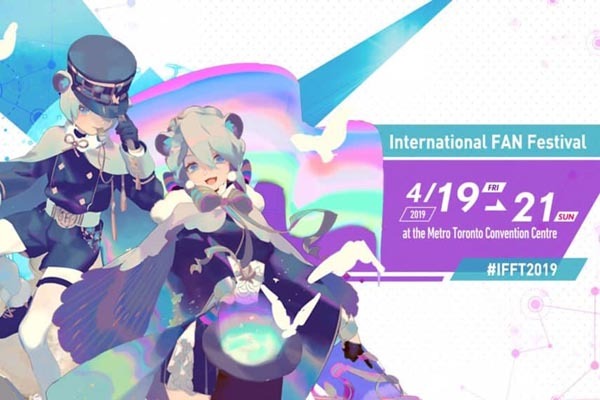 “Anime, music, comic, novels, gaming and more.” https://toronto.ifanfes.com/. Japanese-Canadian. 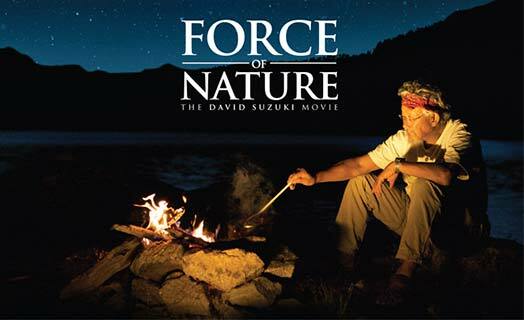 The Force of Nature: The David Suzuki Movie. April 23. 6:30-8pm. Free. The Japan Foundation, Suite 300, 2 Bloor Street East. Tel. 416-966-1600. Note: You can also book this important film yourself from the National Film Board of Canada and the Toronto Public Library. 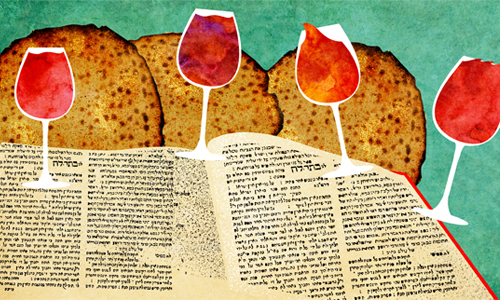 For more information about the traditional Passover: https://www.chabad.org/holidays/passover/pesach_cdo/aid/871715/jewish/Passover-2019-Pesach.htm. Ruth’s note: I try to avoid mentioning film festivals because Toronto has over 130 of them each year which require a whole dedicated blog or two to cover them all. So if you want to find information about film festivals in Toronto on Brazil, Iceland, Nepal, South Africa, or wherever, look into: https://indiefilmto.com/every-toronto-film-festival-2019. I do include a few film festivals that I consider important, and of course the not–to–be missed CIDF which is offering 234 films from a large number of countries, and is free at certain times for seniors and students. In reading the schedule, I found forty-one films that I wanted to see. Alas, my first choice, a screening of Ai Weiwei’s latest work with a personal appearance by the Chinese artist, activist and film-maker himself, is already sold out (except for rush tickets maybe). Dr. Ruth K. Westheimer, Queen Lactati, and John Cleese will also be on stage. But there are plenty of important films still available – depending on your interest. Image of Mr. 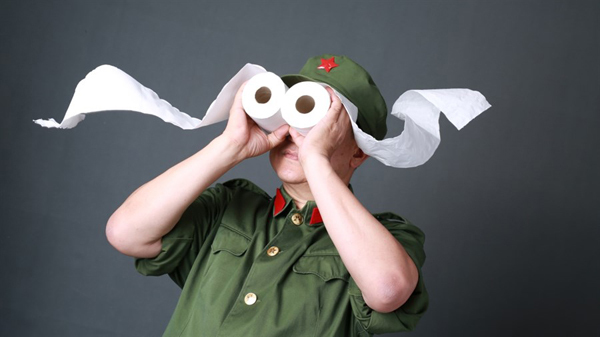 Toilet, the World’s #2 Man from the Canadian International Documentary Festival website. Turkey. Multicultural. International Children’s Day. April 20. 1:30-5pm. Free. Nathan Phillips Square, 100 Queen Street West. Note: Turkey has a holiday, National Sovereignty and Children’s Day, held on April 23 each year. Children sit in the Turkish Parliament and pretend to govern the country for one day. Schools and most businesses are closed. World. 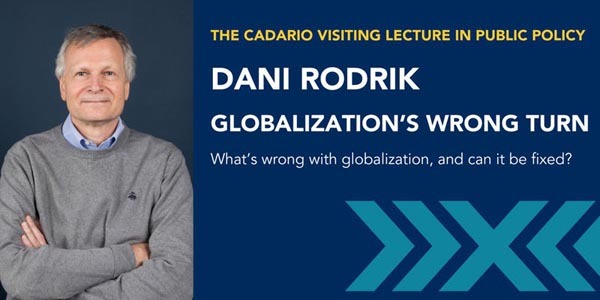 U.S. Globalization’s Wrong Turn – What’s wrong with globalization, and can it be fixed? Thursday, April 18. 6-7:30pm. Free. Isabel Bader Theatre, 93 Charles Street West. Munk School of Global Affairs & Public Policy. Dani Rodrick is a must! Arlene Chan’s talk will be extremely interesting too. What a fabulous schedule of events in this incredibly interesting city. Thanks for this list Ruth.